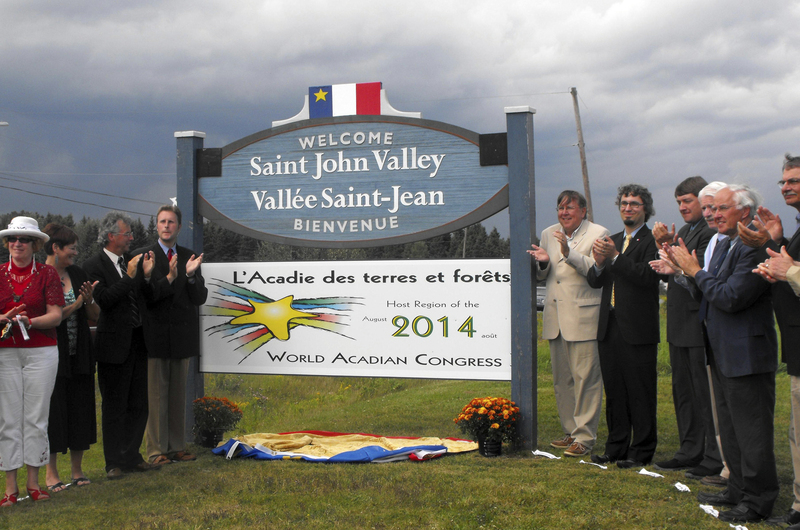 Organizers of the 2014 World Acadian Congress from both Maine and Canada gathered with Maine legislators and others in August in Cyr Plantation for the unveiling of one of four bilingual signs that will be erected in the St. John Valley to welcome people to the host region of the massive celebration. FORT KENT, Maine — Organizers of the World Acadian Congress, who believe the event will bring a huge economic boost to Aroostook County and parts of Canada in 2014, are steaming forward with their plans after learning that the state will commit $1 million to the festivities over the next four years. Jason Parent, president of the Maine delegation to the international organizing committee of the WAC, said Tuesday that he learned of the allocation last week. Parent, other representatives from the Maine delegation, members of Leaders Encouraging Aroostook Development and County legislators met in Augusta two weeks ago with state officials to discuss the critical need for state funding. Parent said that the group met with Philip Congdon, head of the state Department of Economic and Community Development, and Carolann Ouellette, director of the Maine Office of Tourism, to discuss the regional effort to host what organizers have referred to as the largest cultural event ever held in the state. Parent said that Congdon spoke with Gov. Paul LePage, who had previously expressed support for funding the WAC both in a candidates forum held in Aroostook County before the election and after he was elected in an interview with Radio Canada. The funding will come in increments of $250,000 per year over the next four years, he said. 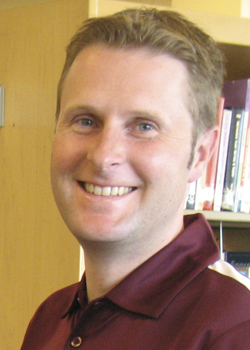 It was unclear, however, which department would be providing the funding. The World Acadian Congress is held every five years in different regions populated by Acadians. The 2014 gathering will be staged in northern Maine, northwestern New Brunswick and the Temiscouata region of Quebec on Aug. 8-24. This will be the first time in the event’s history that it will span two countries. In the past, the event has attracted more than 50,000 visitors for two weeks to host regions including Louisiana and the Acadian Peninsula in New Brunswick. The congress typically features more than 300 events, including family reunions, regional celebrations, and sporting and cultural events. Hotels, restaurants, stores and other facilities typically see a significant influx of revenue. The economic spin-off from recent congresses has ranged from $30 million to $50 million in the host region. In winning the 2014 event, the Maine-New Brunswick-Quebec region, operating under the unified title “Acadia of the Lands and Forests,” beat out applications from Quebec City and Louisiana. While the state’s $1 million contribution now assures that the Maine contingent can move forward with planning, the group is still struggling to secure another $1 million that had been set aside in the federal budget. Early in the planning process, organizers met with representatives from the state’s congressional delegation to discuss federal funding options. U.S. Sen. Susan Collins requested $1.1 million in federal funding in a bill that was passed by the Senate Appropriations Committee last July. Collins pointed out in late January that Senate Majority Leader Harry Reid never brought the bill to the floor for a vote, so the funding never materialized. With the state funds now committed, the Maine contingent has begun planning for the WAC in earnest. A 25-member regional coordinating committee, formed 14 months ago to mobilize Maine’s effort and plan activity in the region, will work collaboratively with the state’s delegates to the international organizing committee and the newly hired executive director Leo-Paul Charest to prepare the northernmost part of the state to welcome visitors from around the world. Don Levesque, president of the Maine Regional Coordinating Committee, acknowledged that there is a “great deal” of work still to be done, saying that one of the first orders of business would be to resume the search for a regional coordinator to help move the planning effort forward. Maine organizers halted their search for a staffer last fall after funding from the federal government became less certain. Organizers will soon begin outreach to local St. John Valley communities to get more people involved in the planning process. This will include reaching out to individuals and groups who would be interested in hosting a family reunion in the Maine sector in 2014. More than 100 family reunions are expected to be held throughout Acadia of the Lands and Forests in August 2014. When the 2014 event arrives, it will feature more than 300 events, including family reunions, popular regional celebrations, ceremonies, sporting events, cultural events, shows, forums and conferences.